We are back from SHOT Show in Las Vegas and trying to figure out where we left off! It was nice to get a chance to connect with some of our firearms industry friends out there. We hope you were among them in that busy 4-day crowd – almost 65,000 in number. At least it was a little warmer in Vegas than in Maine. Now we seem to be into an every other day cycle of snowstorms – ah, Winter in Maine. Lace up your boots and grab your shovels! Our featured rifle for this month is our 20″ Gov’t. solid stock model. This rifle was built after many requests for a standard length rifle that had similar specs and characteristics to a Vietnam era rifle. The 1×7″ twist is designed for heavy bullet stabilization and the barrel has the A2 20″ Gov’t. profile, which is turned for lighter weight under the handguards. It may look “old school” but its all 100% Windham Weaponry quality and of course carries our Lifetime Transferable Warranty. Please see complete details on this model below. We are working on a bunch of new ideas that will be introduced as we roll into 2017 – new models and new calibers – so stay tuned to our website and newsletters to be the first to know. And, if you might be getting a tax refund, or just need some crucial Windham Weaponry parts, check out our Tax Time Savings Sale. 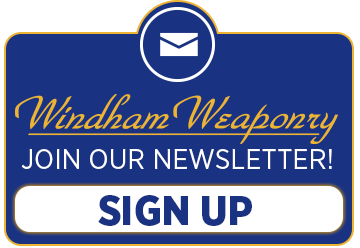 We’ll be offering a variety of great deals through our website – just go to www.windhamweaponry.com then click on Uncle Sam to see this week’s special deals – all offered at 15% OFF! This sale runs now through April 30th, and new items are offered every week. Complete Uppers; Barrels; Magazines; Accessories and more – Check it out! TOPIC: Do you need to clean the Gas Tube on your AR15? I get this question quite frequently and I generally say don’t worry about it. In all of my years of working on AR15s I’ve never cleaned a single gas tube. I’ve seen test uppers that have hundreds of thousands of rounds through them with the same gas tube run fine still without the gas tube ever being cleaned. If you are worried about keeping it clean though it certainly won’t hurt it to spray some powder blaster down the tube though to flush it out. But I believe it is really unnecessary. Will my Windham Weaponry gift certificate be accepted at Windham Indoor Shooting Range and Retail Store? Windham Weaponry Gift Certificates are exclusively for Windham Weaponry merchandise and are not accepted at the Windham Indoor Shooting Range and Retail Store. To purchase a W.I.S.R Gift Card or get more information, please contact the Range at 207-892-0274. The StreamLight ProTac® Rail Mount 1 is a fixed-mount, dual fuel long gun light with a light output of 350 lumens (with CR123A battery power). It is machined from 6000 Series aircraft aluminum with anodized finish. The impact resistant Borofloat® glass lens is high temperature, shock mounted and AR coated. The light source offers C4® LED technology and is impervious to shock with a 50,000 hour lifetime. A TIR optic produces a concentrated beam with optimum peripheral illumination. It can be powered with either (supplied) CR123A or AA Alkaline Batteries. * Run Time: High: CR123A battery – 1.75 hours / AA Alkaline Battery – 4.5 hours. Low settings offer much longer run times. * Length: 4.25″ / Weight: 4.3 oz. The StreamLight ProTac® Rail Mount 2 is a fixed-mount, dual fuel long gun light with a maximum light output of 625 lumens and a range of 625 meters. It is machined from durable anodized aluminum with an impact-resistant tempered glass lens. The impact resistant Borofloat® glass lens is high temperature, shock mounted and AR coated. The light source offers C4® LED technology and is impervious to shock with a 50,000 hour lifetime. Its engineered optic produces a concentrated beam with optimum peripheral illumination. It is supplied with 2 CR123A Lithium Batteries. * One handed snap-on & tighten interface keeps hands away from muzzle when attaching or detaching to Picatinny Rails (no tools required). * Length: 5″ / Weight: 5 oz. Haven’t forgotten about you guys, as you can see I have been busy with the Windham. I spent 5 months working on a friend’s high country farm (33,000 acres) and helped out culling some nanny thar. The next email I sent you is the group we cleaned up – my friend got 3 and I got the rest using your varmit AR15. The aftermarket trigger was step one in improving its accuracy, then I added the muzzle brake you recommended and this made the rifle pin point accurate. It shoots between 1/4 and 1/2 MOA and have no problem shooting groups of thar at 300+ yards – usually get 3 or 4 animals with 4 to 5 shots and always some wind to deal with. Biggest string was 23 animals from one group closest 154 yards and furtherest away 326 yards, took 28 shots. I have never used a muzzle brake before and in NZ the key item is normally a moderator/silencer format which I have on Jack’s Ruger AR15 and will stick with the muzzle brake as rifle doesn’t move with each shot. The Windham varmit AR15 is an outstanding weapon – I rate it beside the BAR243 and Sako 222 I used when I was full time hunting for the NZ Forest Service back in 1980. If I could of had a Windham like my one back in 1980 I would have been in “Heaven”. Use the Photos as you want. The gun is hellish good and superbly accurate and it gets used regularly and dragged through some rough country hence all the bumps and dings on the rifle in the photo, again holds its zero never misfires or looks like it will miss. The rifle is a credit to the staff at Windham its base make up of barrel, action and assembly are the key to its superb performance on the hill – if you ever get out here make sure you get in touch and I will organize a trip to the farm to shoot some thar. Once again thanks for your time it was an eye opener for me and a well run manufacturing operation. Note: Nanny thar are a species of goat introduced to New Zealand from the Himalayas that have no native predators in New Zealand. They are a major threat to many plant species in the alpine regions and as such are classified as pests in New Zealand. I received many thoughtful messages in response to our January newsletter, both about WW rifles and bikes. I have highlighted some of each this month and appreciate the opportunity to connect with all of you. Thank you to all of our readers for continuing to share your feedback. Good to see you are back at the office. In your latest newsletter, you had an article about chamber plugs, and I am requesting one. Thank you!! I also bought 2 tickets to help you and family through your ordeal. God bless you!!! You also mentioned that you like to see pics of the WW builds. I’m attaching a pic of mine. Strange looking indeed. What I have done is a build for defense only at 100 yards and in. One 1″ riser, a 3/4″ cantilever riser and a 3x fixed prismatic scope complete the build. When I shoulder the WW, the scope (being 5″ above the bore) matches up exactly to my eye, thereby eliminating parallax so I don’t have to move around to acquire a target. My son and 2 buddies all agree that the WW looks really weird, but all 3 of them hit the paper at 50 and 100 yards. It’s just one of those deals that works well for me. Almost forgot this, I also added a Slidefire stock to my WW. I built your gun for Defense only – there are good people and good reasons for gun ownership. My Dad is 96 years old and one of the last surviving World War II Air Force Veterans. He is the man that taught me how to shoot and shoot safely. Thanks again to you and WW for the great customer service that I have experienced!!!!! Glad you are back and doing well. I’m so glad you’ve recovered from your accident. Not much protection on 2 wheels. I sold my motorcycle back in the mid 80’s because where I live in north Alabama the majority of drivers have no respect for a motorcycle. They would sit at a stop sign and wait until I got close and then pull out in front of me. It was a tough decision for me but it was one I had to make. I hope the automobile drivers where you are have more respect for a bike than they do down here. Anyway, I hope you’re back to 100% and enjoying riding again. It looks like God answered the many prayers sent up for you and I’m so thankful He did. As far as my WW rifle goes, I wouldn’t trade it for a Colt or any other brand on the market and I would put it up against anyone of them in a shooting match. I’m so glad Mr. Dyke re-created jobs for all you good Windham Weaponry folks after the other company sold you all out. The Windham Weaponry story is the reason I bought a WW rifle. I was going to buy a Bushmaster until I just happened to read the Windham Weaponry story. I can relate somewhat to it myself. The company I spent over 21 years of loyal service in just up and shipped most of our jobs to Mexico and China. The plant went from over 400 hourly workers down to less than 30. I felt a connection to you good Windham folks and I’m as happy as a pig eatin’ slop that I bought a Windham Weaponry MPC M4 Carbine. I’ve fed it with several different brands of ammo and magazines and it hasn’t failed in any shape, form, or fashion. In my opinion it’s the best AR on the market right out of the box. Keep up the good work and I hope you (and WW) have a great year. So glad to see you back to work. I’m sure it’s been a long and painful journey but I’m gratified that you know how much you are cared for by all of us in the Windham Weaponry Family. I noticed your Centurion Membership availability at the Store/Range. 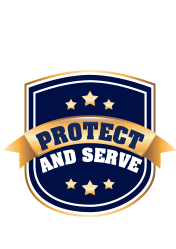 What a great service to the first responders and warriors in your community! More businesses in the industry should follow that excellent example. Welcome back! We missed you. It’s good to see you back in the chair and hopefully back in the saddle, you don’t know me, I just get your employers newsletter and I understand what it’s like to be down. So ride safe as you can with all the idiots driving these days. Our Windham is like a good shepherd: ready to guard the flock at all times!